The winner of the Special Jury Prize & Alfred P. Sloan Film Prize at the Sundance Film Festival is coming to Blu-ray in November. 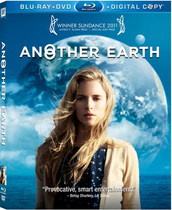 In an early announcement to retailers, 20th Century Fox has slated 'Another Earth' for Blu-ray on November 29. On the night a mirror Earth emerges in the sky, two lives are intertwined in a dramatic incident that will change them both forever. In his directorial debut, Mike Cahill brings this provocative indie sci-fi film to life with outstanding performances from newcomer Brit Marling ('Sound of My Voice') and William Mapother (TV’s “Lost,” 'World Trade Center'). This "deeply emotional...extraordinarily profound" (USA Today) film became a must-see sensation at the Sundance Film Festival. "Beautiful, bright and fearless" (Associated Press) newcomer Brit Marling and fan favorite William Mapother (TV's “Lost”) star as Rhoda and John, two people whose worlds collide after a tragic accident. Their intimate drama plays out against the astounding discovery of Earth 2, a parallel world that poses provocative and fascinating possibilities. Does a new Earth mean a chance at another life? Another destiny? Another self? “'Another Earth' is science-fiction at its best" (The Hollywood Reporter) -- with a mind-bending surprise ending that you will never forget. The Blu-ray will feature 1080p video, a DTS-HD Master Audio 5.1 soundtrack, and supplements will include: Deleted Scenes; Music Video: “The First Time I Saw Jupiter” by Fall On Your Sword; The Science Behind Another Earth; Creating Another Earth; and Fox Movie Channel presents “Direct Effect with Mike Cahill,” “In Character with Brit Marling,” and “In Character with William Mapother.” As an added bonus, consumers will receive two tracks from the band Fall On Your Sword, who provided the soundtrack to the film. You can find the latest specs for 'Another Earth' linked from our Blu-ray Release Schedule, where it's indexed under November 29.